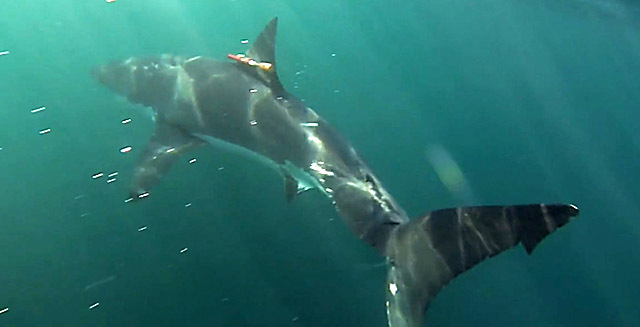 This video frame grab shows one of MBARI’s prototype camera tags on a white shark in the waters off South Africa. Image courtesy of the Monterey Bay Aquarium. Despite being well-known to the public, white sharks are still somewhat of a mystery to scientists. For example, previous research suggested that white sharks prefer open water and rarely venture into kelp forests. But new research using an MBARI-inspired “camera tag” shows that some sharks in South Africa spend a lot of time in kelp beds where they may even be hunting for seals. Since 2015, engineers at MBARI and researchers at the Monterey Bay Aquarium have been working together to develop an open-source video camera tag that would allow researchers to observe the behavior of these large predators directly in their natural marine environment. Designed and tested primarily on white sharks, the innovative instrument offers a glimpse into the sometimes mystifying lives of these oceanic predators by collecting video footage that provides a “shark’s-eye-view” of the ocean. Researchers in South Africa used a video tagging technology called “animal-borne video and environmental data collection system,” which has features inspired by MBARI’s Shark Café Cam. Using this system, they made a surprising discovery about white shark behavior, which they describe in a recent article in Biology Letters. Observations of white shark foraging behavior show they generally surprise their prey and swim up from below to attack animals like seals and sea lions at the ocean surface. The study published this month, however, suggests that white sharks may exhibit a different hunting strategy in a habitat that was once considered off limits to these large predators—the kelp forest. A fiberglass shark fin–art piece or research tool? May 18, 2016 - Engineer Thom Maughan created a lot of buzz at MBARI when he left a blue fiberglass shark fin in the upstairs lobby.